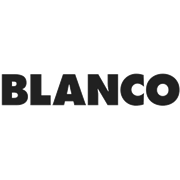 BLANCO gas cooktops represent the very latest in kitchen quality. With ceramic black glass design, cast iron trivets & smooth one piece hob design they are perfect for any kitchen. High Performance Burners with 17Mj Wok burner - High quality burners provide even heat distribution for great cooking results, whilst the 17Mj Wok burner offers powerful cooking for dishes such as stir-frying. 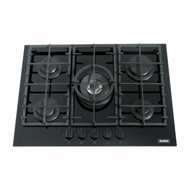 Smooth One Piece Black Glass Hob Design - The smooth one piece hob with European inspired Black Glass design makes it both elegant in appearance and easy to maintain. Cast Iron Trivets - Complimenting the robust construction of the stainless steel unit, whilst providing a non-slip surface for pots and pans. Automatic Ignition - Ease of operation, no need for manual ignition, simply twist the knob and the gas connection ignites. Available in Natural Gas or Propane - The cooktop is supplied adjusted for natural gas installation, however can be converted for propane application (conversion kit supplied).